2000 grafts where transplanted using FUE method, dr. De Reys, all in a single day. Wow that s a lot of hair for 2000 grafts! This is the best I have seen from your clinic. There is no toppik in his hair? Are there any special pricing for clients coming from the US? » Are there any special pricing for clients coming from the US? We are now able to transplant about 3 times as many as a couple of years ago without any extra expenses. 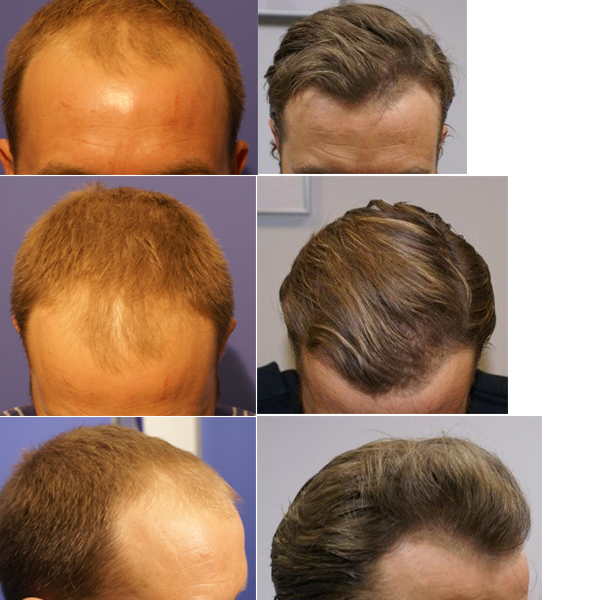 It has always been our goal to make FUE more affordable for those seeking this type of procedure to solve hairloss. Absolutely no enhacers are used, pictures are unedited. I don’t know what’s more amazing. The workmanship or the price. I agree this is the best I have seen from your clinic. » I don’t know what’s more amazing. The workmanship or the price. It looks too good to be true with only 2000 grafts. Are you sure there is no toppik in these pics ? » Are you being sarcastic? I was paying a compliment. » » Are you being sarcastic? » I was paying a compliment. I guess you haven’t seen that many hair transplant pics before. I’ve seen enough poorly done and /or expensive transplants. This one’s neither hence my compliments. Honestly, what the hell is your problem? It seems too many people on hairsite like to read - pessimistic remarks - between the lines. I need to see more pics to be convinced. It’s unheard of having hair this thick with only 2000 grafts. » no toppik in these pics ? Hey, that is not a funny remark. IF there where any enhancement either by toppic or photoshop I would have informed about this. Come over and meet the patient, that is all I can say in our defence. Please remember that FUE grafts contain 10-20% MORE hairs than comparable strip grafts. » » no toppik in these pics ? » toppic or photoshop I would have informed about this. » Come over and meet the patient, that is all I can say in our defence. This is really the best I have seen, I notice you have a V shape design for his hairline, I guess he still have receding temples because of that? It’s hard to tell from the pics. you keep saying this about fue and the hairs are more but you never prove it, can you show us how many hairs were in the 2000 grafts in this person? Maybe no toppix but there is definitely something there to build up the volume. It’s impossible to get this kind of volume and density using 2000g. No way! » it, can you show us how many hairs were in the 2000 grafts in this person? Think about a strip being taken out. It contains a mixture of 1,2,3,4 hair grafts. What is in the strip is in the strip, nothing more or nothing less. Think about an FUE doc picking grafts individually from a donor area about 3 times as big as the strip. Logically there will be many more 2,3 and 4 hair grafts to choose from, some call it cherry picking. 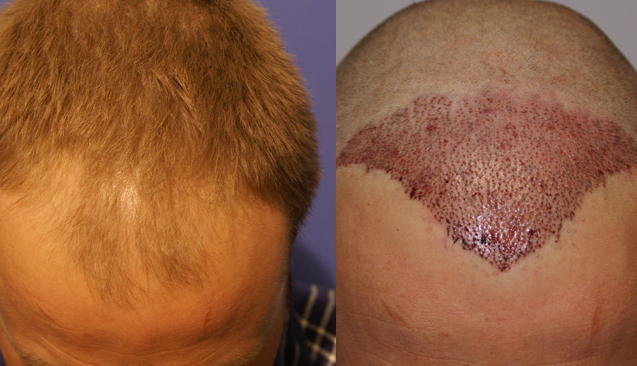 It is a no brainer to know that the FUE doc gets much more hair per graft if he desires. I dont even believe any FUT doc will dispute this fact. » hair grafts to choose from, some call it cherry picking. » I dont even believe any FUT doc will dispute this fact. to you it is a no brainer but to anyone else that is thinking of having a transplant its a big issue that you push as a benefit but do nothing to back it up with facts. you didn’t answer my question either, how many hairs did this guy have done, 2000 grafts is how many hairs; and if you are so sure about this show us your study to prove it, you must have done one otherwise you wouldn’t know it was true.